How to Make Brochure Stands At Your Home? Brochure stands, popularly known as brochure holders are available in many styles and sizes. You can find brochure holders in offices and various stores. Business owners spend a lot of money on brochures and brochure stands. The brochure holders are generally made of wood, metal or acrylic. You can also make them at home, if you have the right colors and materials to opt for. You can distribute brochures to your targeted audience, but that is time consuming and also requires man power. If you leave a stack of colorful brochures on your desk, it will look extremely messy. Therefore, the best option is to display the brochures in an attractive brochure holder. Display of promotional literature in an attractive brochure stand helps in promoting the services and products of a company. The brochure holders can store many brochures. If someone visits the company for the first time, he will definitely get attracted to the brochure stand displaying several brochures. He can go through some of the brochures to know about the products and the services that the company offers. You can keep the brochures on a tabletop also, but then it won’t look attractive enough to grab someone’s attention. The brochure holders look attractive and stylish. 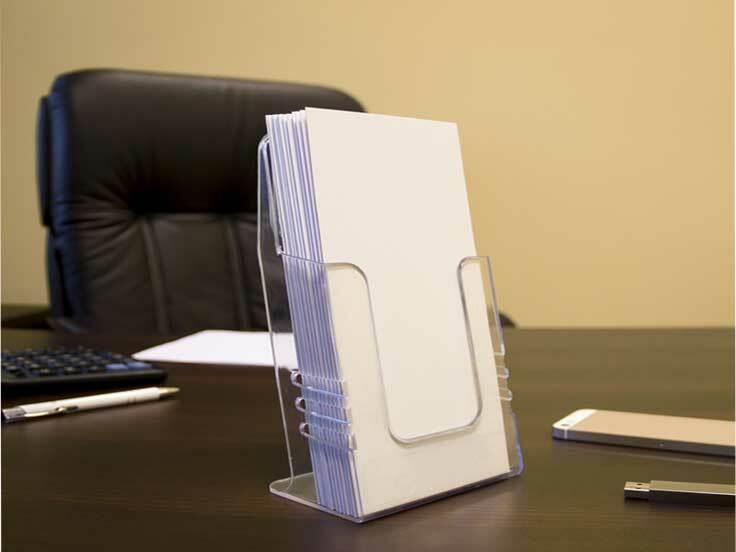 If you work from home, you should place a brochure holder in your home office to display all the services and products that you offer to your clients. How to make handmade brochure holders? Brochures are a great way to advertise products and services. If you have cardboard and duct tape, you can easily create a brochure stand to display your brochures. First of all, you need to cut out a 4 inches square from the cardboard. This will form the bottom of your brochure stand. Now, you have to cut out 2 pieces from the cardboard to form the 2 sides of the brochure holder. Both the pieces should be 8 inches tall and 4 inches wide. Be careful about the measurements when you cut out the pieces from the cardboard. You have to cut another piece of the cardboard for the front of your brochure stand. The piece should be 6 inches tall and 4 inches wide. For the back of your brochure holder, you need to cut another piece of the cardboard which should be 8 inches tall and 4 inches wide. Now, you need to use duct tape to attach the long edges of the sides of the holder to the edges of the back. Now, you have to fasten the front of the brochure stand to the edges of the sides. Cut out another 6 inches square from the cardboard. Fasten it to the bottom of the brochure holder. You need to do this for adding stability. Finally, decide the color that you want to use on your brochure stand. Spray paint it with the color of your choice. Be careful and slow so that the color doesn’t get smudged. Allow it to dry. And there, you have your colorful brochure stand on which you can display all your brochures. Thus, you can see that it is very simple to make brochure stands at home. You can use brochure stands in your home office.